Gaijin is performed by Pamela Z on voice, processors, samples and BodySynth™, and Butoh dancers Kinji Hayashi, Leigh Evans, and Shinichi Momo Koga. The music consists of layered, dynamically varied sound works with text derived from PZ's own writing as well as stories gathered from various people's "foreigner" experiences. 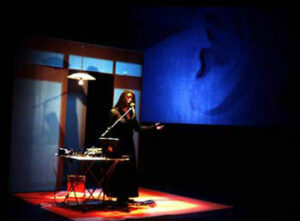 The texts are spoken, sung, played as samples, and projected in the space along with other images. The Butoh movement was developed by Z and the three dancers, and takes place on various levels, throughout an environment designed by set designer Lauren Elder, lighting designer Elaine Buckholtz, and videomakers Jeanne Finley and John Muse. Gaijin is a commonly used Japanese slang term for "foreigner". It is the (often derogatory) shortened word for the (neutral) "Gaikokujin", which literally means "foreign-country-person". During the first six months of 1999, I lived as a Gaijin. I was in Tokyo on a residency granted by the NEA and the Japan/US Friendship Commission. It was a rich and rewarding experience, during which I learned a great deal. One of the most profound lessons was finding out what it is like to truly be an alien in the place where you live. Even though my stay was only 6 months, it made me wonder how it might feel to be in a similar but more permanent circumstance. I thought about all the "gaijin" who live in San Francisco– people who feel like aliens in the US either because they don't speak English, speak with an accent, or have an outward appearance that brands them as "other" in some way. I also thought about the many different levels on which one can be "alien" in their own world. During my earlier months in Japan –before I had learned much Japanese and didn't know my way around– I often found myself doing something involuntarily. I would see some American or European-looking person approaching on the street, and I would just give them a little nod, like a "Hello." It was the very thing that I used to hate when Black people did it to me in the States. I used to think, "I don't know you, so why are you acting as if we are old friends or something?" And now, here I was doing the very same thing to people I didn't know! Funny, that I had to go all the way to Japan to fully understand what was going through the minds of those Black people when they would nod to me in the States! Perhaps they went through life feeling misunderstood by and unable to communicate with the White people around them, and perceived me as "one of their own". I never understood that before, because I never felt that way in the States. Thinking about my own reactions and about the various ways Japanese people reacted to me caused me to more closely examine attitudes I've encountered in the States and my own attitudes about foreigners. I questioned the meaning of the word "foreigner" and began creating scenarios built around the concept of foreignness. The scenarios were also fueled by my Butoh studies in Yokohama with Sensei Kazuo Ohno. Naturally, these ideas became the seeds of a new performance work.